For the first time in years, OpenMPT comes with a manual again! OpenMPT 1.20 introduces a template system that can be used to quickly access often used plugin, pattern, sample and instrument combinations. When closing OpenMPT, a single dialog with a list of unsaved files is now shown instead of one message box for each modified file. Crash recovery: When a crash is encountered, OpenMPT will try to save modified documents to a temporary location and close the audio device. The latter can especially help with ASIO drivers that become unusable after a program crash. MIDI CCs that are being received from an external MIDI device can now be mapped to pattern / sample / instrument editor shortcuts. The resonant sample filter has been rewritten and sounds pretty much identical to XMPlay's and Impulse Tracker's filter. Adding and removing channels creates an undo point now instead of clearing the undo log. Like in Impulse Tracker, it is now possible to show the default sample volume if there is no volume command next to a note. OpenMPT can now record incoming aftertouch MIDI messages to patterns as either volume commands or MIDI macros. The new sample tuner can be used to tune samples in the sample editor to a given note. The MIDI macro system has been rewritten completely and is now even more powerful and (hopefully) 99% compatible with IT's MIDI macros. Some macro letters have been changed / added, read the manual for more information. OpenMPT comes with its own MIDI Input / Output plugin that can be used to route MIDI events from external devices to other plugins or to send MIDI events to your MIDI gear. Plugins can now route MIDI events to follow-up plugins. This can be useful for LFO, arpeggiator or groove plugins. Some multi-output plugins like Kontakt (64 channels version) won't crash anymore. Built-in support for jBridge to provide support for 64-Bit plugins and other plugins that won't load in OpenMPT. Exception handling for crashed plugins does finally work again, so the overall stability of OpenMPT as a VST host has increased. This is really just the tip of the iceberg, so for a complete list of changes, have a look at the release notes and the full version history. wooow, it looks like a huge work you did guys! Thank you! Yeah folks! I'm soooo excited! Thanks to all who worked on this...I opened MPT today to lay down some backing tracks and I got the popup notification that 1.20 was out! Made my day. Now all we need is a proper pr. channel Oscilloscope type waveform display as well as a stereoscope just like in the old ProTracker days. Watching waveforms live is not only cool but actually very useful! Thank you for very much, OpenMPT team and coders! I've always admired this tracker, and use it frequently. I have found that this tracker has always been great for both beginners and experts, with its plethora of features. 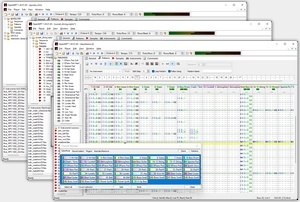 In my opinion, this tracker has always been the "modern de facto" tracker for budding computer musicians. Once again, thank you all, and continue working towards the proverbial "extra-mile."